What is the minimum age for a rider? Our age limit for riders is 8 years old, no younger! Anyone who is 15 years old or under must have someone who is 18 years or older with them. What is the weight limit for a rider? Our weight limit is 250lbs per rider. I have a medical condition / disability, can I go horse back riding? Guests are not allowed to ride double on one horse. Can I go horseback riding if I am pregnant? Pregnant ladies must have a doctor’s note to ride. Yes, reservations are recommended for all trail rides and are required for trail rides longer than 3 hours and Cookouts. Will we trot or gallop? All of our rides travel at a walk and in single file. This is to ensure everyone’s safety on these shared trails. Guests should arrive at the location 30 minutes before the ride is scheduled to depart. You must wear sturdy, closed toed shoes and long pants are best for riding. Please note that sandals of any kind are not permitted. Mosquito repellent is highly recommended.. Yes, helmets are provided and are mandatory on all our trail rides. What style riding will be used? We use western tack and western trained horses. No experience necessary. Our guides will provide a brief riding instruction. Our minimum age for this activity is 9 years old. You’ll be riding 5-6 hours each day with breaks and leisurely lunches. We have guest parking at Warner Stables. Please be aware the parking lots are not locked or guarded. The lodge is licensed and so under Alberta law we cannot allow self brought alcohol to be consumed. We do have alcohol for sale at reasonable prices. You will lose phone reception approximately half way to the lodge. There is no cell service or internet at the lodge. Please refer to our detailed packing lists for items to wear and bring on the lodge trips and tent trips. What should I have with me on the horse? Your rain gear will travel with you on the horse and your guide will help you attach it to the saddle. If you would like to bring a saddlebag, please fill them with only those essential items that you would need during the day, such as lip balm, your camera, sunscreen, bug spray, etc. We reserve the right to limit the amount of gear in the saddlebags for weight. Fanny packs (a small pack that ties around the waist) also work well. 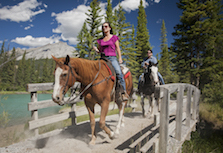 Daypacks, backpacks or other bags are NOT allowed — they are hard on your back and hard on the horse’s back, and do not tie properly to the saddle. We have a limited supply of saddlebags available free of charge which are available for pick up upon check-in (sorry, no earlier). When should we arrive for check-in? Please arrive at Warner Stables ready for check-in at 9:30am for lodge trips, and at 8:30am for tent trips. Please arrive at the times provided and not any earlier to reduce time spent waiting at the barns before your ride departure). Nightly accommodation, dinner, breakfast and packed trail lunch. All bedding is provided. We do not have private rooms however a whole room can be booked at an additional cost. What should I bring on the backcountry tent trip? A detailed list will be provided in your booking confirmation, and is also available here. What should I bring on the backcountry lodge trip? There are no age restrictions for the public sleigh ride and children under 3 are free. However on the public sleigh ride children under 3 are not guaranteed a seat (they may have to sit on your lap). Unfortunately children or babies aren’t allowed on the private sleigh ride has liquor is provided. We do not offer pick ups for the sleigh rides, however the location of the sleigh rides is conveniently located close to downtown Banff. We recommend that everyone dresses warm with mitts, hats and boots. You are outside in the cold for 45 minutes so be sure to have multiple layers and a thick winter jacket. You are provided with a blanket, but if you are concerned about being cold you can bring one along for yourself as well. Unfortunately you are not able to bring your animals on this tour as it may scare the horses. How many people will be on the sleigh with me? There are two different public sleigh sizes, a 12 seater and 18 seater. The sleigh may or may not be full on your tour. When should we arrive for check in? Please arrive between 2pm and 4pm at Sundance Lodge. Please ensure that you arrive no later than 4pm. Free parking is available at the Healy Creek Trailhead on Sunshine Road near Sunshine Ski Resort (approximately 10kms from the Town of Banff). How long will it take to ski/snowshoe in? The 10km trail from the Healy Creek Trailhead is rated easy to moderate and will take 2.5 to 4 hours depending on experience level and pace. Active wear suitable for skiing. Layers are best, warm base layers, top layers and outerwear suitable for the temperature and weather. Comfortable clothing for inside the lodge and a backpack to carry belongings. We would also recommend a flashlight, sunscreen, sunglasses and camera (charged).